The name of the silk in this image is Soaring in His Righteousness. The colors in it are sky blue representing open heaven, white representing righteousness, and burgundy representing brought with a price. Soaring isn’t simply about flying at great heights, it is also about rising quickly. Now is your time. Allow your prayer and praise to move your spiritual feet quickly forward as the wind of His Spirit catches wings lifting you and carrying you allowing you to soar. 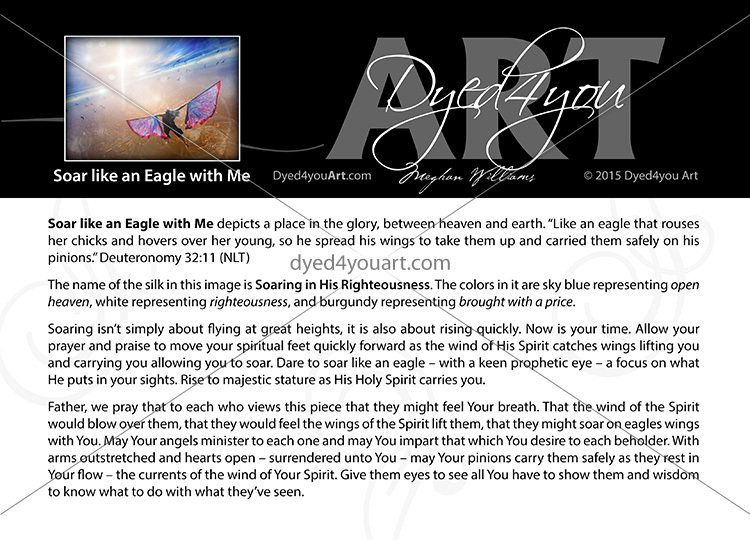 Dare to soar like an eagle – with a keen prophetic eye – a focus on what He puts in your sights. Rise to majestic stature as His Holy Spirit carries you. Father, we pray that to each who views this piece that they might feel Your breath. That the wind of the Spirit would blow over them, that they would feel the wings of the Spirit lift them, that they might soar on eagles wings with You. May Your angels minister to each one and may You impart that which You desire to each beholder. 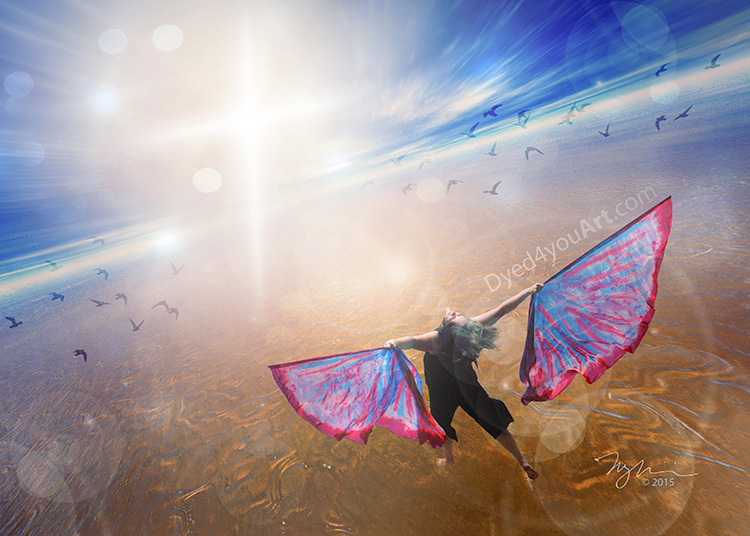 With arms outstretched and hearts open – surrendered unto You – may Your pinions carry them safely as they rest in Your flow – the currents of the wind of Your Spirit. Give them eyes to see all You have to show them and wisdom to know what to do with what they’ve seen. BRILLIANTLY AMAZING! THE LORD IS PLEASED! It is reminding me today of just how important worship is in our everyday life. Thank you for sharing your creative gifts with us Meghan! The photo is beautiful! And the words behind it are wonderful. Love the prayer! I receive it! Beautiful! 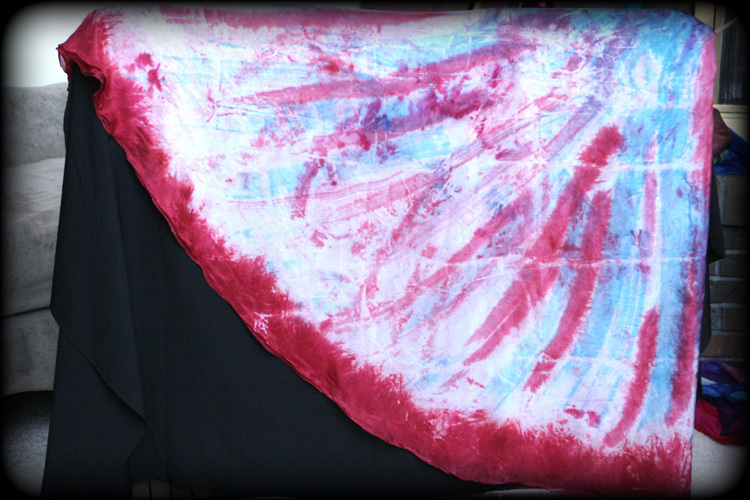 I love the colors of this silk, and the message that goes with this beautiful piece. Where can I find the prices for your art sets?